^ 4.0 4.1 4.2 Bowers Encyclopedia, Part 35. ^ 7.0 7.1 7.2 Pike, p. 48. ^ 8.0 8.1 8.2 Swiatek & Breen, p. 166. ^ Swiatek & Breen, p. 167. ^ 12.0 12.1 Taxay, p. 63. ^ 14.0 14.1 14.2 Bowers, p. 73. ^ 15.0 15.1 Vermeule, p. 165. ^ Bowers Encyclopedia, Part 37. ^ 19.0 19.1 Swiatek, p. 142. ^ 20.0 20.1 Garofalo, p. 40. ^ Bowers Encyclopedia, Part 36. Bowers, Q. David. A Guide Book of United States Commemorative Coins. Atlanta, Ga.: Whitman Publishing. 2008. ISBN 978-0-7948-2256-9. 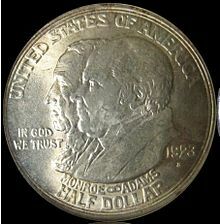 Slabaugh, Arlie R. United States Commemorative Coinage second. Racine, Wis.: Whitman Publishing. 1975. ISBN 978-0-307-09377-6. Yeoman, R.S. A Guide Book of United States Coins 68th. Atlanta, Ga.: Whitman Publishing. 2014. ISBN 978-0-7948-4215-4. Bowers, Q. David. Chapter 8: Silver commemoratives (and clad too), Part 35. Commemorative Coins of the United States: A Complete Encyclopedia. [2015-03-23]. （原始内容存档于2013-10-16）. Bowers, Q. David. Chapter 8: Silver commemoratives (and clad too), Part 36. Commemorative Coins of the United States: A Complete Encyclopedia. [2015-03-23]. （原始内容存档于2013-10-16）. Bowers, Q. David. Chapter 8: Silver commemoratives (and clad too), Part 37. Commemorative Coins of the United States: A Complete Encyclopedia. [2015-03-23]. （原始内容存档于2013-10-16）. Cregan, Bill. 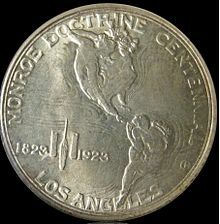 The Monroe Doctrine commemorative half dollar. The Commemorative Trail: The Journal for the Society for U.S. Commemorative Coins. 2008, (3): 24–27. Garofalo, Michael. Hooray for Hollywood!. The Numismatist. 2015-02: 34–40. Pike, William E. A silver half for the silver screen. The Numismatist. 2003-03: 47–48.